Daria Wall-Mounted Storage Cabinet in White The beautiful Daria collection stands out in any bathroom with strong, clean lines and elegant raised panels. There's plenty of cabinet space, the doors are soft-close construction, and chrome detailing completes the look. Daria deftly combines the function of today with a nod to the elegance of the past. It's the new modern classic styling with a contemporary twist. Daria Wall-Mounted Storage Cabinet in White is rated 3.7 out of 5 by 3. 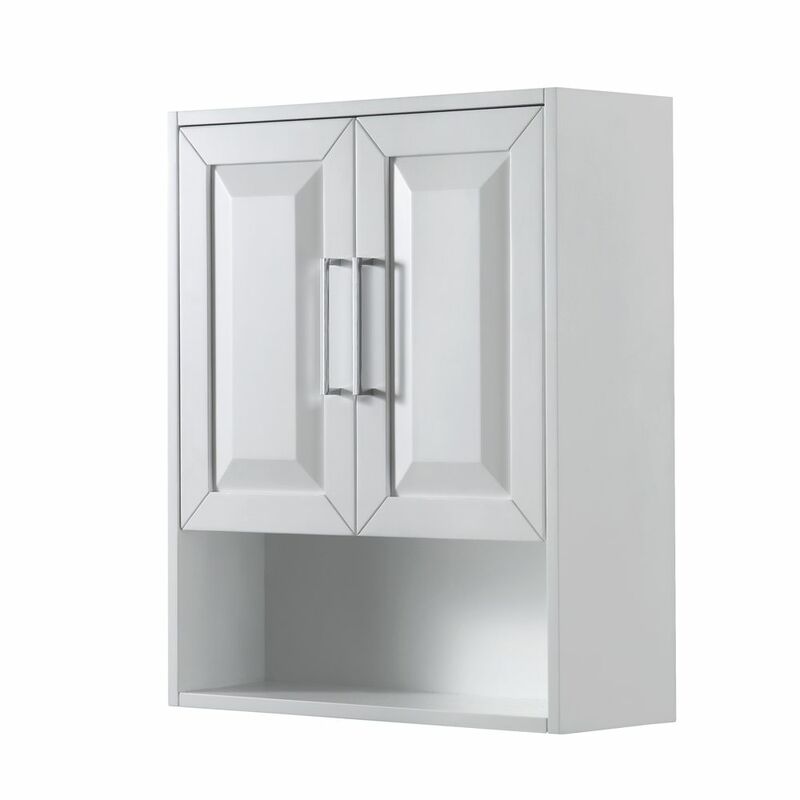 Rated 5 out of 5 by Nell from Lovely addition to a renovated bathroom This cabinet is a beautiful addition to a bathroom. Well constructed and spacious. Rated 1 out of 5 by Julie from The quality and appearance of the cabinet are very nice.... The quality and appearance of the cabinet are very nice. It's a sturdy cabinet and installation seems to be straight-forward. Unfortunately, I cannot give this cabinet a high rating. The installation instructions are not included in the packaging. You must access them online from the Home Depot product listing. In addition, the instructions say to use a 5/16 drill bit for drilling the holes for the wall anchors. This results in a hole too large for the included plastic wall anchors. In my case, I was unable to locate wall studs in which to mount the wood cleat used to hang the cabinet, so I had to rely solely on the strength of the wall anchors to support the weight of the cabinet. Because of the incorrect information regarding the drill bit size, the wall anchors did not hold the cabinet weight. Within two minutes after installing the cabinet, the wall anchors failed and the cabinet fell off the wall and broke the toilet tank below it as well as the lower shelf of the cabinet. I've had to replace the toilet at a cost of $350 and the $234 cabinet needs to be repaired or replaced. If you buy this cabinet, do not rely on the faulty installation instructions and do not use the included wall anchors. They are cheap plastic and unreliable. I would recommend drilling a smaller diameter hole for the anchors and buying metal, expanding wall anchors that will hold the weight.